General Motors India, the Indian unit of the American auto giant has launched the all new Chevrolet Sail UVA hatchback in the Indian market, as announced by the company around a year back. The new Chevrolet Sail U-VA model is loaded with all bells and whistles on all fronts including the comfort & convenience, safety & security and styling. Let’s take a look at new Chevrolet Sail features at all fronts one by one. At the exterior, the car is blessed with a range of class-apart features like Hawk Wing Style Front Headlamps and Shooting Star Style Front Fog Lamps. The combination of both of these features offers a fascinating appeal to the front profile of the car. Moreover, the new 12 spoke – 14 inch Alloy Wheels give a finishing touch to the exterior, adding glitter to the gold. 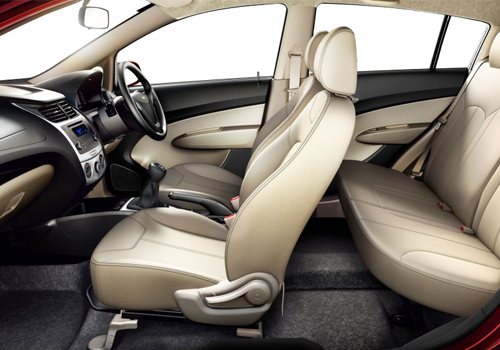 Inside, the car is loaded with some of the first in segment features, enhancing both style and appearance. The mentionable Chevrolet Sail U-VA interior features include Dual Tone Interiors and More to up the style quotient, all four power windows, V-style sporty steering wheel, advanced entertainment system etc. The entertainment package of the car includes a Fun Wide” Audio System which is not only Bluetooth enabled whi9ch completely transforms your Mobile Music Streaming. The technological advancement has been further achieved by offering Aux input as well as a USB. Now coming to the Chevrolet Sail UVA comfort & convenience features, the sail is fully equipped with the likes of Flex Flat” Folding Rear Seats which gives you an option of adjusting boot space as per your needs and requirements. A number of storages have been provided to make sure the utilization of every single inch of the cars inside space. There are as many as 25 convenient and discreet storage spaces spread throughout the car. The fuel tank of the car is centrally mounted, which encapsulates cross structure, and offers extra protection in case of a sudden collision. The Chevrolet Sail safety and security feature list is fully filled with the advanced equipments likes dual front airbags, Child-Protection Rear Door Locks, ABS (Antilock Braking System) with EBD (Electronic Brake-force Distribution), remote keyless entry, etc. The car is offered notable features and best comfort. Chevrolet Sail UVA price is low, exterior features are impressive and interior space is very comfortable. It's available in affordable price tag and excellent safety features. xvi	I’ve been looking around for a practical hatchback and haven’t seen anything that has me interested… But the latest launch by Chevrolet, the Sail U-VA is literally the most practical hatchbacks in India…So spacious from the inside with foldable seats. Fantastic job by them…! I’ve been looking around for a practical hatchback and haven’t seen anything that has me interested… But the latest launch by Chevrolet, the Sail U-VA is literally the most practical hatchbacks in India…So spacious from the inside with foldable seats. Fantastic job by them…!